Eager to serve the One, a young songkeeper travels to the dark and foreign nation of Hazor, but her confusing, rough-edged companion has lost his Restorer gifts. 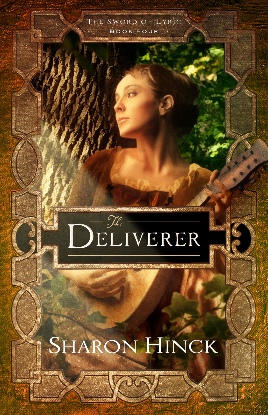 Eager to serve the One, a young songkeeper travels to the dark and foreign nation of Hazor, but her confusing, rough-edged companion has lost his Restorer gifts. As danger rises against them both, she loses her freedom, her memories, and her hope. Now even the very music of her soul is threatened. In our world, Susan Mitchell no longer feels at home in the carpool lane. Burdened by the unhealed scars from her trips through the portal, she fights to suppress her worry about her son, who remains out of contact in Lyric. But when a mysterious message hints Jake is in danger, she and her husband are swept away—to the place they least expect. Clan rebellions. Lost Restorers. Has the One turned away, or will the face of the Deliverer bring light to the darkness? Book 4 of The Sword of Lyric series.